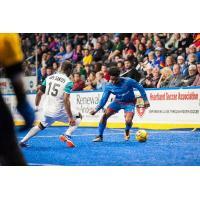 KANSAS CITY - Hot and heavy, the Kansas City Comets overcame the St. Louis Ambush 11-7 at Silverstein Eye Centers Arena. The Comets high scoring second half helped them battle to a win and closer to the remaining playoff spot in the South Central Division. Both teams started the game with high energy, streaming up and down the field and intercepting passes. However, the Ambush were the first to find the back of the net. Off a mistake pass on the Comets, Lucas Almeida put St. Louis up 1-0. Kansas City was awoken, keeping unrelenting pressure in St. Louis' defensive third. They were rewarded with multiple free kicks. Blocks from the Ambush defense and saves from keeper, Paulo Nascimento, kept the score frozen. St. Louis went up again, this time on a power play. Almeida found Magui Souza for the Ambush's second goal of the quarter. The Comets broke through with less than a minute left in the first quarter. Mirko Sandivari gained his first goal of the season and the Comets found themselves down only one goal. Kansas City started the second quarter firing on all cylinders. Ramone Palmer read and intercepted an Ambush pass to force Nascimento out of the goal. Kiel Williams easily put the ball into the empty net to even the score. It did not stay for long as Mario Marcos gave the Ambush the 3-2 lead. Former Comet, Stefan St. Louis scored and put St. Louis further ahead. Resilient as ever, the Comets did not stay down long. Kevin Ellis beat an Ambush defender and rocked the ball between the posts. Kansas City was coming closer at a 3-4 score. However, Stefan St. Louis and Lucas Almeida found their second goal and assist respectively of the night before halftime. Down by two, Kansas City's mission to start the second half was to score. And they did just that. Anthony Grant beat Nascimento only a minute into the second half, putting the Comets within one again. A blue card on St. Louis gave the Comets another ample opportunity to level the score. Kansas City did not waste it as James Togbah scored his eighth power play goal of the season, still leading the league. Ignacio Flores put one in less than a minute later to give the Comets their first lead of the game. Leo Gibson kept the scoring train going on another power play, stretching his scoring streak to seven games. The Comets kept the two-goal lead through the third quarter. He scored his second of the game less than a minute into the final quarter. Almost back-to-back blue cards found Kansas City at a two-man disadvantage. Despite playing with three players against St. Louis five, the Comets defense stood strong and kept the Ambush without a shot for the duration of both penalties. The game intensity continually climbed as the clock wound down. The desire to win was exhibited in every tackle, shot, and pass. St. Louis pulled within two with a goal from Zach Reget and another assist by Almeida. Ramone Palmer took advantage of St. Louis' sixth attacker for Kansas City's ninth goal. Almeida scored the Ambush's last goal of the game with almost two minutes left in the game. The rivalry between the two teams was evident with the physicality that ensued in the last minutes of the match. Leo Gibson completed his hat trick and Ellis netted his second to round out the night. With tonight's win and results from the other teams in the South Central Division, the Comets now hold a two-game advantage over St. Louis and two and a half over Orlando for the final playoff spot. The Comets next travel down to Florida for a two game weekend in the Sunshine State. The Orlando SeaWolves will be the first to take on the Comets on Friday, March 29 at 6:35 pm CT. 24 hours later, Kansas City will face the Florida Tropics at 6:05 pm on Saturday. Catch both games on MASL.tv and 38 the Spot as the Comets climb to secure their playoff spot.